Microsoft on 09/06/2018 released a new preview for PCs with ink support in the Microsoft To-Do app, Sticky Notes 3.0, and a delay snip feature in Snip & Sketch. This build is from the 19H1 branch, which, as its name indicates, will arrive in the first half of next year. Microsoft is simultaneously in the process of finalizing the RS5 branch, which represents the Windows 10 update the company plans to release later this year (likely in October 2018). Windows 10 is being developed as a service, meaning it receives new features on a regular basis. Microsoft has released five major updates so far: November Update, Anniversary Update, Creators Update, Fall Creators Update, and April 2018 Update. The Microsoft To-Do app has gained support for handwritten input (you’ll need version 1.39.1808.31001 or higher). This means you can capture tasks by writing directly on the list’s surface, complete your tasks by striking through them, and use check marks within the circle to the left of a task to complete it. Fast Computer Repair Services, We offer monthly maintenance Plans. We offer monthly maintenance plans http://pccorzo.com/support/ Call us for your customized plan 786 217-4939 or 855 722-6796. 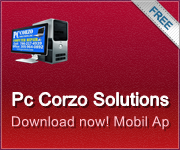 Powered by Pc Corzo Solutions Inc and the PcCorzo.